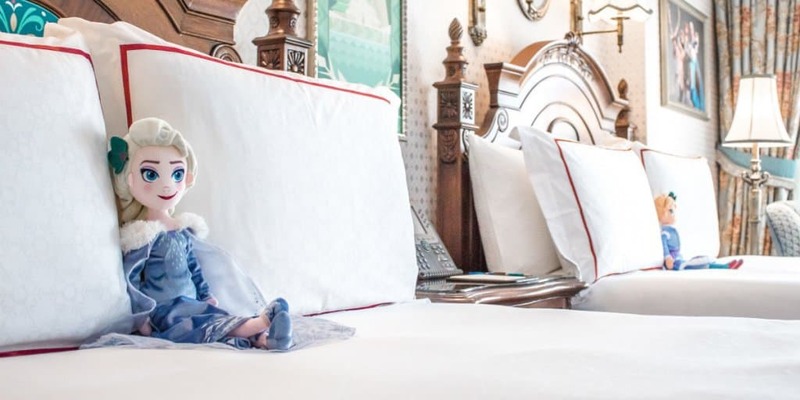 Hong Kong Disneyland Resort is now offering the Frozen Suite as part of their Kingdom Club level rooms at the gorgeous Hong Kong Disneyland Hotel. Kingdom Club is an excellent way to add a bit of luxury to your stay. I’ve done the Kingdom Club a few times as a splurge and don’t regret it one bit — my wallet tells a different story. 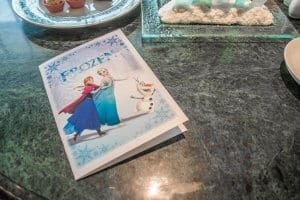 We had an opportunity to experience the Kingdom Club Frozen Suite this summer. A huge thank you to Hong Kong Disneyland Resort for providing the room for a night during our stay. This allows us to share our experience, review, photos, and videos with all our fellow Explorers! 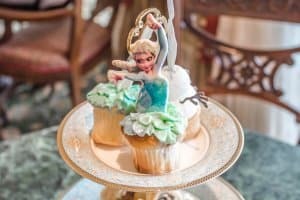 Are you planning a trip to Hong Kong Disneyland? 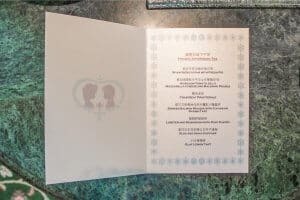 Don’t forget to study our Ultimate Hong Kong Disneyland Trip Planning Guide, it helps you create the perfect vacation. 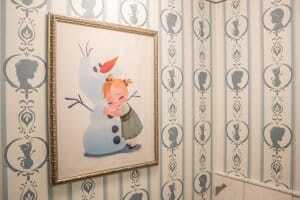 The Frozen Suite is the first-of-its-kind for fans of Frozen. 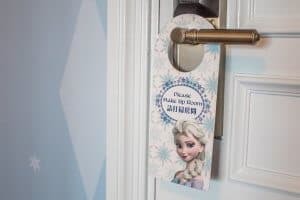 From the themed door in the hallway all the way through to the music playing from the TV, you’re fully immersed in the Kingdom of Arendelle. The suite comes with two washrooms, a walk-in shower, jacuzzi, living room, bedroom (2 double beds), TV, balcony, a corner with cushions and children’s books, and more. 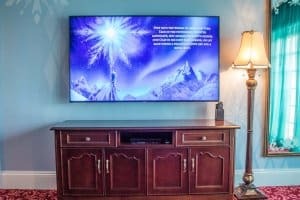 When we first walked into the room, the TV was blasting an instrumental version of “Let It Go.” It took me a few moments to figure out it was coming from the TV. I had a moment when I thought the entire suite had music pumped into it. Don’t worry, you can turn the music off on the TV. I’m not the brightest sometimes. The suite (except the balcony) is themed down to the smallest detail. 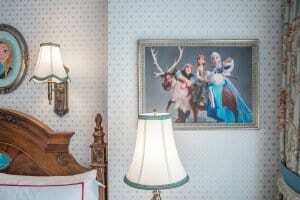 The wallpaper, room slippers, and even the bedsheets have traces of Frozen-theming. 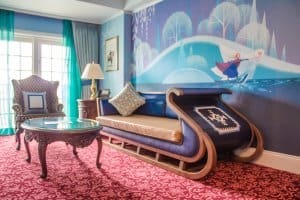 My absolute favourite is the sofa inspired by Kristoff’s sleigh in the main room. My second favourite is the little corner in the living room themed to a log cabin. 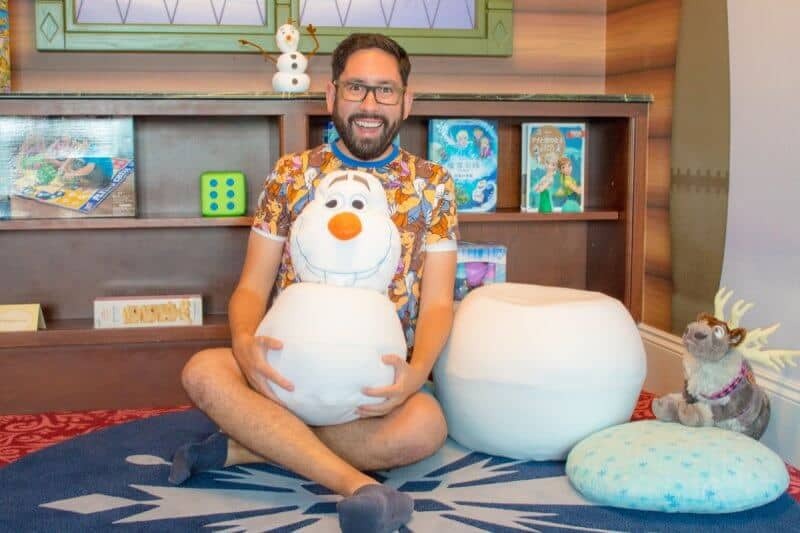 On the shelves are children’s storybooks in multiple languages, an Olaf pillow, and Sven plush. 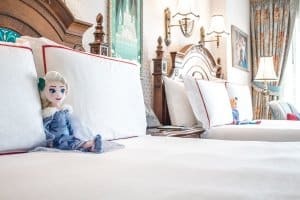 In the bedroom, you’ll see plush Anna and Elsa on the beds and in the closets are Frozen Suite-themed bathrobes and slippers. The beds aren’t too soft but aren’t firm either, which is my preference. The large bathroom is perfect for families, where there’s ample space to get ready. 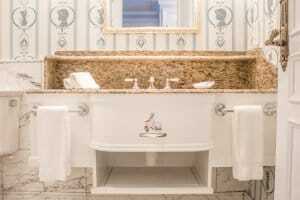 The walk-in shower has plenty of room and the jacuzzi is a great way to unwind after a day in the Park. Don’t forget to grab your amenities kit. 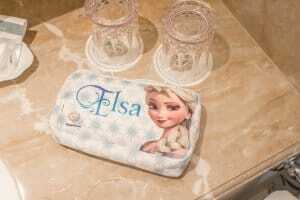 Note: You are able to keep the slippers, amenities kit, and Hong Kong Disneyland paper bag. 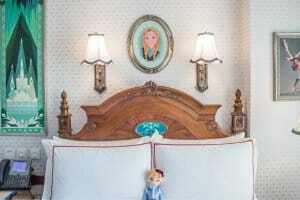 The plush, storybooks, and bathrobes are an extra charge (there’s a price list in the room). Since you’re on the 7th floor (top floor of the hotel), you’ll get an incredible view. The side we were on had an excellent view of the Hong Kong Skyline on a clear day (it’s quite humid year-round so getting a view mid-day is tough). The balcony is the only part of the suite that isn’t themed. 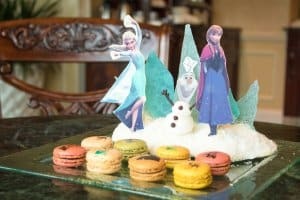 Another perk the Frozen Suite is you’ll get a plate of macarons when you get to your room. The macarons are different flavours and a copious amount of chocolate to create a cute dessert to share (pictured below). 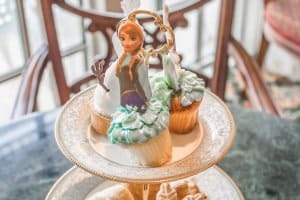 In addition, you’ll also get a Frozen-themed Afternoon Tea Set when you visit the Kingdom Club Lounge. 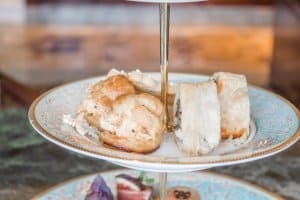 It’s full of sweet and savoury bite-sized snacks to share. 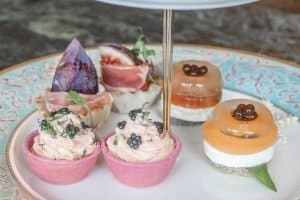 The Afternoon Tea Set was lovely and quite filling. A few of the savoury items are seafood based, so if you’re not a fan you’ll skip a few of the most delicious items. Overall, the room is well-themed, immersive, and is much more than a simple overlay. 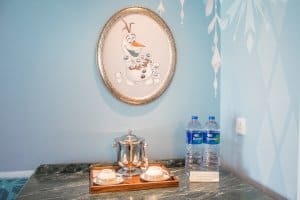 The level of detail that went into these suites is outstanding and a welcomed addition to the Hong Kong Disneyland Hotel. 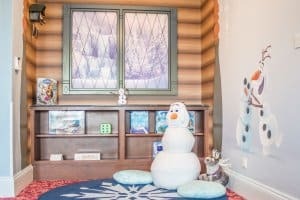 With the new Frozen land coming to Hong Kong Disneyland as part of their multi-year expansion, I foresee these rooms becoming popular as time goes on. My favourite perk is access to food and drink in the Kingdom Club Lounge. 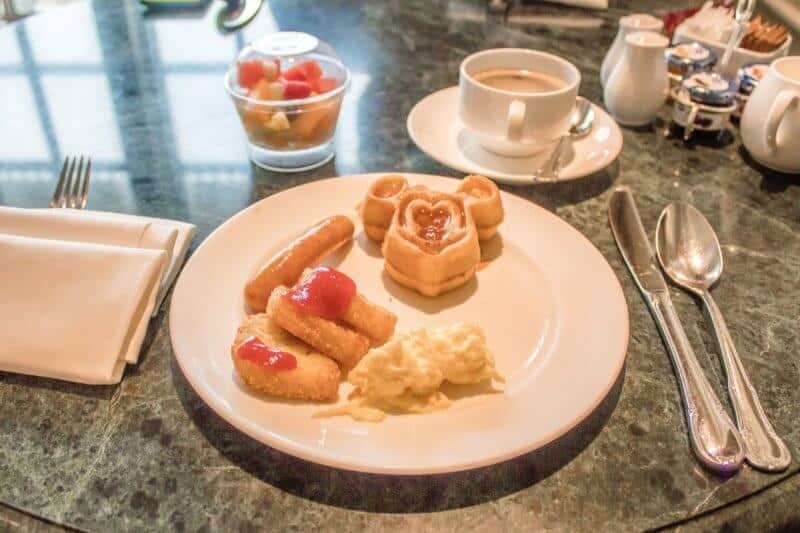 In the morning is a light breakfast, which is perfect to get you going and still have room to snack and dine in the park later. Don’t worry, they have mini Mickey waffles too. During the day, you can come back to the lounge and relax with drink and snacks. The best part of the day — in my opinion — is the sunset hours where beer and wine are available. For times of all the above activities and lounge food, please check with a Cast Member, everything is subject to change. 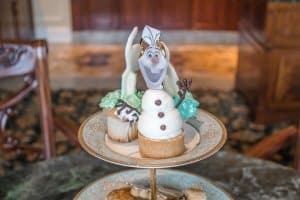 If you’re a fan of Frozen and are able to splurge, the Frozen Suite is definitely worth it. The level of detail in the suite, spacious rooms, and access to the Kingdom Club amenities make for a luxurious and memorable stay. The normal rate is $7,800 HKD ($1000 USD) per night, which isn’t cheap nor in every Explorers budget. Chances are, if you’re reading this, you’re a planner. 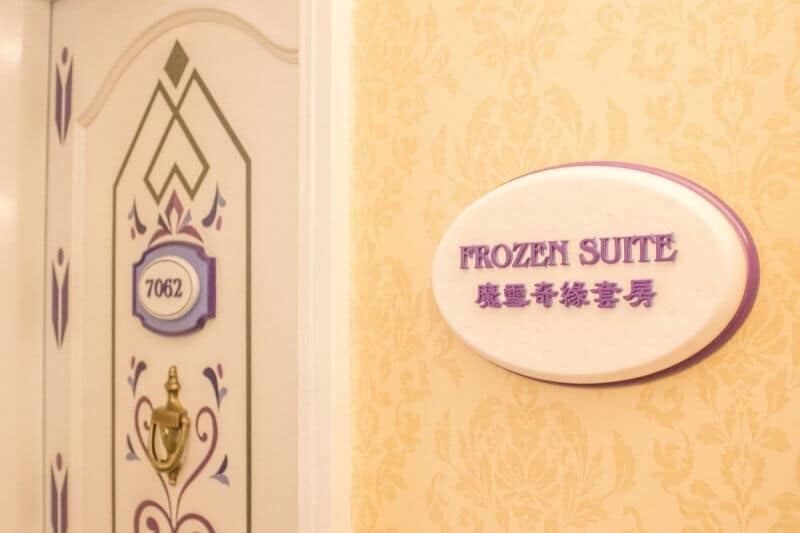 You’re able to save money on the Frozen Suite if you reserve your room well in advance. Make your booking 21 days before your arrival and you’ll save 15% and get the room for $6,630 HKD ($847 USD) per night. Compared to the normal price (above), you’ll save about $153 USD per night. 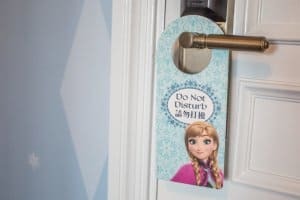 To keep costs down, I recommend doing a split stay with a night in the Frozen Suite then staying in the normal rooms at the Hong Kong Disneyland Hotel. 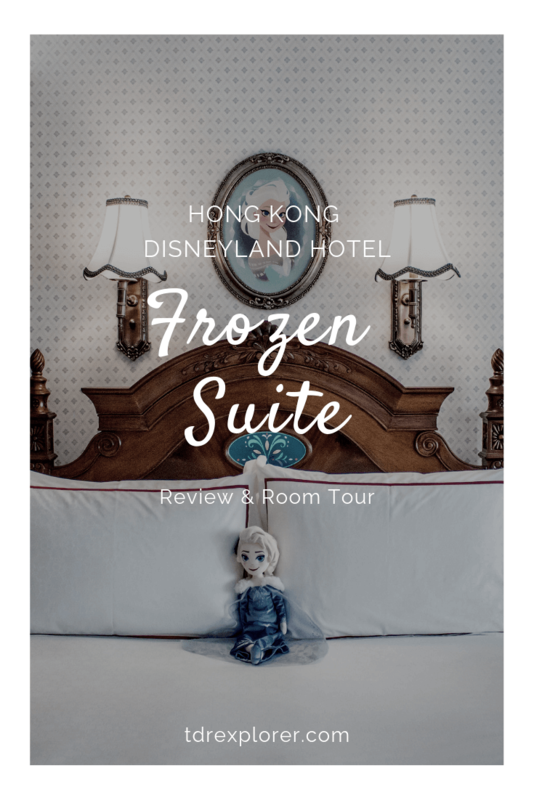 While the Frozen Suite is spectacular, if you’re not a fan but still want a luxurious stay at Hong Kong Disneyland (at a lower rate), then opt for the Kingdom Club Room or Suite. Where you’ll still get access to all the Kingdom Club level amenities. These rooms start at $3,060 HKD ($505 USD) and $5,100 HKD ($651 USD) per night. 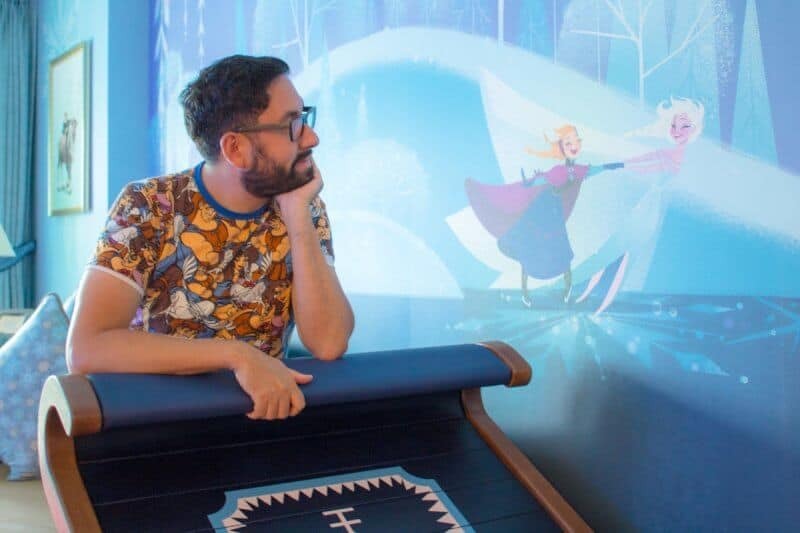 I’ve stayed in the Kingdom Club Room before for a night in summer 2017 and it was worth the splurge. If you’re on a budget, then this is room is definitely not budget-friendly. In that case, I recommend staying at Disney’s Hollywood Hotel for $1,530 HKD ($195 USD), if you want to stay on property. Otherwise, you’ll need to stay off-site in the city of Hong Kong. Or for a bit more, the Disney Explorers Lodge is my favourite Disney Hotel. 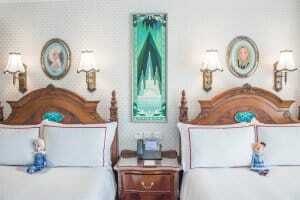 There are constantly package deals for the Disney Hotels, keep an eye on the website. 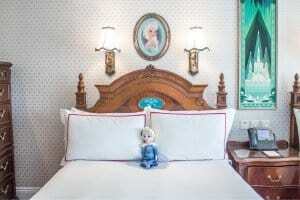 Book your stay at the Hong Kong Disneyland Hotel directly through the official website. Feel free to use any photos here for non-commercial purposes with credit to TDR Explorer.